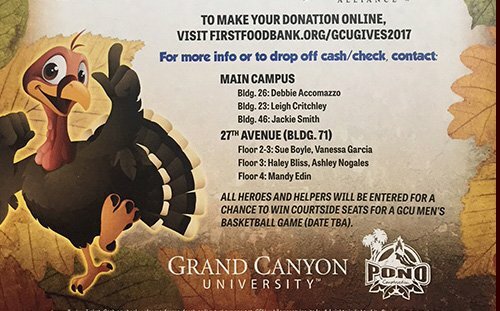 Grand Canyon University is embracing a whole new way of putting thousands of turkeys on Thanksgiving tables across Phoenix. 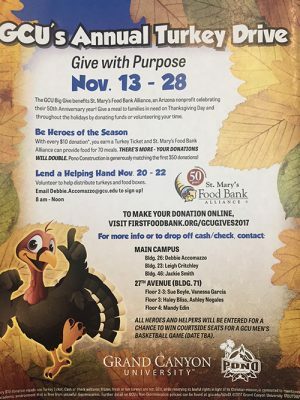 GCU’s annual Turkey Drive, which kicked off Tuesday and ends Nov. 28, features two ways to give – distributing as well as donating the birds – and introduces a new beneficiary, St. Mary’s Food Bank Alliance, celebrating its 50th anniversary. The 2017 Turkey Drive is on! Donate your time or dollars and get entered to win a drawing for Lopes basketball courtside seats. GCU and St. Mary’s Food Bank Alliance, located at 2831 N. 31st Ave., are not only neighbors, they also share a mission to lift up area residents and end the cycles of hunger and poverty. Since GCU’s Learning Lounge first opened its doors to provide academic assistance to local K-12 students, St. Mary’s Food Bank Alliance has been there with nutritious meals. In Arizona, one of every four children goes to bed hungry and one of every seven senior citizens is forced to choose between medicine and food, said Jerry Brown, St. Mary’s Food Bank Alliance Director of Media Relations. GCU employees who sign up to participate in food distribution from 8 a.m.-noon Monday and Tuesday and 8 a.m.-11 a.m. Wednesday will be out on the front lines, Brown said. They will be among 250 volunteers and 150 employees who will act like NASCAR crews and load the turkeys, trimmings and food boxes into the backs of cars that pull up six at a time, 4,000 an hour, Brown said. “It’s like a NASCAR pit stop, only we fill the cars with food,” Brown said. Boyle’s team formerly worked in the Peoria office and now resides in Building 71 alongside employees who formerly worked in Tempe and Building 66. Suzanne Boyle, Administrative Assistant of the College of Nursing and Health Care Professions, keeps the Golden Turkey Trophy as a point of pride. “We are going to make this campaign more about giving,” Boyle said, but she added that irresistible incentives will soon be revealed. Now – With every $10 contributed, you earn a Turkey Ticket and St. Mary’s Food Bank can provide food for 70 meals. There’s more – Pono Construction is matching the first 350 donations from GCU. Donate here or by contacting Debbie Accomazzo, Leigh Crichtley or Jackie Smith on the main campus. If you work at 27th Avenue, contact Boyle, Vanessa Garcia (second-third floors), Haley Bliss, Ashley Nogales (third floor) or Mandy Edin (fourth floor). Super Saturday (Nov. 18) — Groups like the GCU baseball team fan out to 28 Albertsons and Safeway stores across the Valley and collect thousands of turkeys on behalf of St. Mary’s Food Bank. Last year the baseball team raised $3,518 at Safeway Sun City – one of the most successful collections in the state. 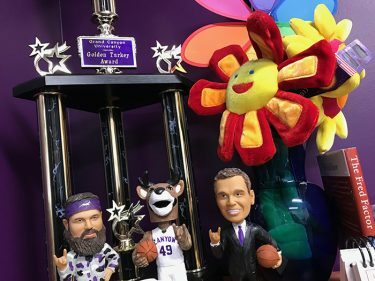 Monday-Wednesday – GCU employees can join other community supporters – such as members of the Phoenix Suns and the Office of Arizona Gov. Doug Ducey – in distributing turkeys with all the trimmings to more than 12,000 families who pick them up at St. Mary’s Food Bank. GCU is donating the Halo parking garage for volunteer parking, and shuttles will run back and forth. To volunteer, email Accomazzo, Community Outreach Manager. Volunteer hours are HR approved for Community Service Time. Nov. 28 – The 2017 campaign will wrap up on Giving Tuesday, a global day of giving fueled by the power of social media and collaboration. Nov. 29 – All participants will be entered for a chance to win courtside seats for a GCU men’s basketball game (date TBA).